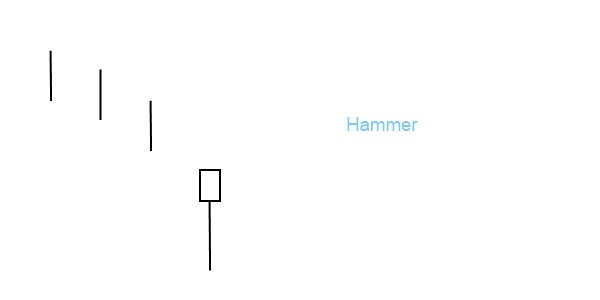 The hammer is a common trading signal, made up of a single candlestick. It has a small body with a long lower shadow. The shadow is at least twice as long as the candlestick itself. There is very little or no upper shadow at all. The body may be black or white, it’s not important. A white bodied hammer candlestick is more bullish in nature than a black bodied one. If it occurs with increased volume all the more better.The pattern can be spotted in a downtrend. The hammer pattern is quite similar in appearance to the hanging man, but it occurs in a downtrend and is a bullish signal. It’s considered a market bottom or a support. If the price trades above the real body on the following day, the trend reversal sign is confirmed.